• Ship to Italy with DPD. Prices start from just £29.66. Italy is known for its sun, its cuisine and its strong family values – and with DPD, it can be known for swift, reliable delivery too. Our couriers ensure that whatever it is you need to send to Italy, you’ll get it there without any problems within the time you expected. Thanks to our extensive European delivery network, we’re able to offer economy and express delivery services for prices that you won’t find anywhere else. 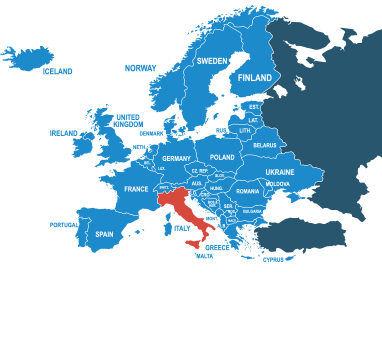 To find out why you should choose DPD for your delivery to Italy, get a quote at dpd today. Delivery within 4-8 working days. Italy belongs to the European Union. Thankfully, this means that you won’t need to worry about paying customs duties or filling out excessive information when you ship to Italy from Ireland. You might think that sending with Europe’s expert couriers would be an expensive affair, but – thankfully – that’s not the case. When you book a delivery to Italy with dpd, you’ll be able to ship from as little as £29.66, while still getting that sky-high quality of service that DPD are famous for. For more information, please refer to our prohibited items list.